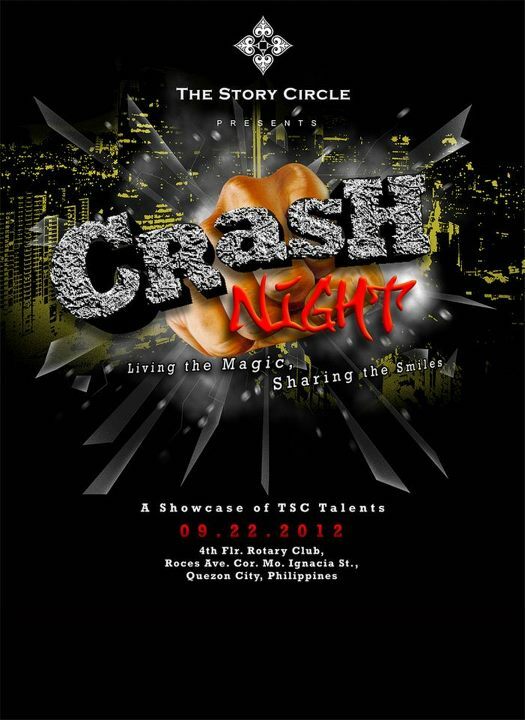 This event is on September 22, 2012, 7:30PM - 10:00PM at the 4th floor, Rotary Club, Roces Ave. cor. Mo. Ignacia St, Quezon City. Watch performances by Justin "Mental Assassin" Piñon, Nomer "MindMaster" Lasala, Ody Sto. Domingo, Sam Halili, Tong, Anthony Andres, Xebec, Ernest, Quiel Em and many more. Tickets are sold at Php 150 only. A magician named Carlo used the term “crash” whenever he breaks in his new effects to strangers in various malls around the metro. At about the same time, another magician named Nomer started crashing on the café’s customers during TSC gatherings. Two months after Carlo made his first attendance, he was taken by a mall's security, after allegedly causing a mass of onlookers to gather on the mall’s hallway. The security personnel cited that Carlo had no permit to perform publicly. This incidient sparked TSC members’ appetite for performing on strangers. It was slowly becoming TSC tradition to approach strangers in all walks of life – security guards, househelps, the wealthy, foreigners, and models - who happen to be anywhere near TSC’s gathering place. The word “crashing” caught on and became synonymous with “performing for strangers” and TSC members. Crashing is now a TSC custom. Membership requirements was even amended to oblige an applicant to “crash” before prior to being considered a certified member. To date, if magicians hear the word “crash”, they automatically think of The Story Circle and whenever a magician uses the word “crash”, that magician is assumed to be associated with TSC. The Story Circle Network was started in 2003 as an online shop and repository for both magic and occult resources by Lei, a Filipino Wiccan practitioner and semi-professional magician. Shortly, a forum was put up for members to be able to discuss their thoughts online. In February 2003, The Story Circle Network Forums is divided into 2 sections – a Wiccan forum and a Magic discussion board. Around 2003 – 2004, the pioneer members started registering in. By 2005, the moderators of the Wiccan boards were busy with work and other activities to maintain the forums so they joined in with the Philippine Wiccan Society (PWS), the largest Wiccan community in the country. During the last quarter of the same year, former co-workers Lei and Mamot started planning about re-developing The Story Circle Network as a site purely dedicated to the art of close-up conjuring. From January to February of 2006, the re-invention of Story Circle began. Designs for the website were made and the old design, even though most found it beautiful, was taken apart. The logo was also changed from a pentagram symbol to the 4-spade design TSC has now. By March, The Story Circle Network was known as The Story Circle Philippines. How much is the ticket price? Sorry I know you shared their FB link, it's just that, FB is blocked in our office.